When a beam of light hits the surface of Al-Alq3 film, largest lateral photovoltage (LPV) can be obtained in the upper layer and Si substrate, denoted as VAB and VCD respectively. The temperature dependence of LPV is shown in the upper inset. When sufficiently energetic irradiation is incident on a p-n or MS/MOS junction, transverse photovoltaic effect can be observed, which is widely used in solar cells. Furthermore, when a nonuniform irradiation is applied on the junction, an additional photovoltage parallel to the plane of the junction can be obtained, which is called lateral photovoltaic effect (LPE). LPE has a wide range of applications, especially position-sensitive detectors (PSDs). Till now, the research on LPE is focused on the inorganic MOS/MS devices. However, obvious LPE on metal side can only be observed in the structures with nanoscale metal layer due to the shorting effect. Recently, the research group, led by Prof. 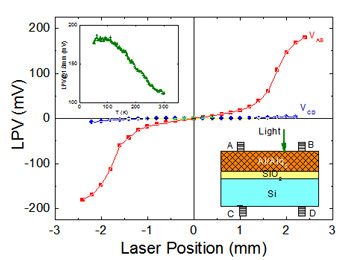 Gang Ni, from the Department of Optical Science and Engineering, Fudan University, has reported large lateral photovoltaic effect in the Al-Alq3 granular films on Si wafer, with a largest lateral photovoltage (LPV) sensitivity of 75mV/mm, which is close to the LPV value in inorganic LPE devices. Furthermore, optimal LPV can be achieved by adjusting the metal composition of granular film, which may be beneficial in the application of high sensitivity PSDs. With the decrease of temperature, the LPV increases accordingly, which is directly related to the temperature dependence of resistivity in the upper layer. Further theoretical fitting verified this point. It is reported in Chinese Optics Letters Vol. 12, No. 4, 2014 (http://www.osapublishing.org/col/abstract.cfm?uri=col-12-4-040402). Now, the study on microstructure is being carried out to understand the mechanism, and LPE devices with better performance are being developed for possible applications.